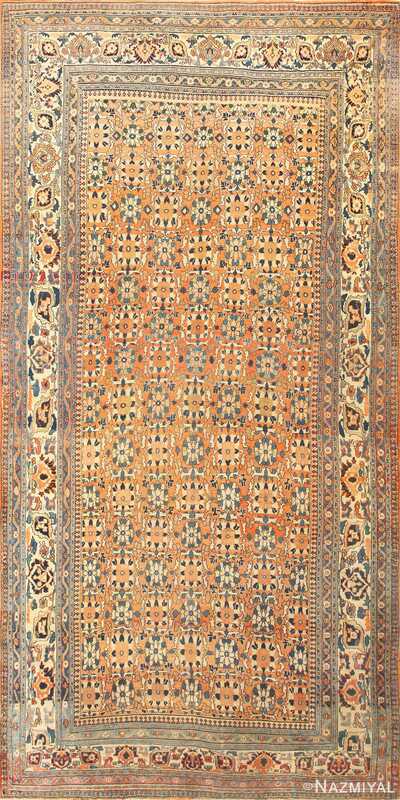 This comely antique Khorassan runner from Persia is resplendent with an allover floral and vine scroll pattern, set against a beautiful orange brown field. Highly Decorative Antique Persian Khorassan Runner Rug, Country of Origin: Persia, Circa Date: 1900 – Here is a beautiful antique Persian rug – a runner rug length piece from Khorassan. Characterized by a classical composition, this comely composition boasts a beautiful, classical allover pattern of vine scroll and floral elements. For nearly eighteen feet, meticulously woven detail work dances across the charming orange-brown field. A similarly attractive series of inner and outer borders surrounds the field, completing the classical composition. Admirers of antique Oriental rugs, and of antique Persian rugs in particular, are drawn to Khroassan rugs such as this that exemplify the refined tradition of rug making. Woven into the allover floral and vine scroll pattern and intricately detailed borders of this gorgeous antique Persian Khorassan rug is an ancient rug-making tradition. Possessed by a mastery of craft and an exemplary classical design, this antique Khorassan Persian runner is a truly remarkable antique rug.